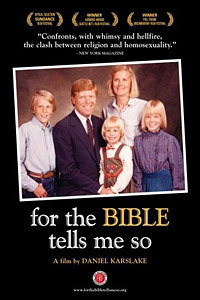 For The Bible Tells Me So (Director: Daniel Karslake): This documentary came to my attention through Joel Heller’s excellent site Docs That Inspire, before it played at Sundance this past January. The film explores the intersection of homosexuality and religion, particularly among conservative Christians, and as such, it tackles a subject near and dear to me. I spent many years immersed in the evangelical subculture and went through the very painful coming-out experience of a close friend. This is exactly the sort of film I wish we’d had in the early 90s. Through the experiences of five Christian families, each with a gay or lesbian child, we watch as real people struggle to integrate their love for their families with their own beliefs and experiences. But this isn’t the typical confrontational sort of film many of us have seen before. Instead, we meet clergy who have wrestled honestly with what the Bible says, and who are able to reconcile their faith with acceptance of gay and lesbian people. It’s gut-wrenching stuff, and not everyone will be convinced by the theology, but at least it gets people discussing the meaning of the disputed biblical passages, rather than just quoting them. I particularly liked that not all the families are the same. Some still struggle to accept what they perceive to be their child’s “sinful” lifestyle, while others have gone on to political activism (in some cases, even to the point of being arrested!). Karslake has made a very wise choice by adopting the name of a particularly obstinate opponent of gay rights, Focus on the Family, as his theme. By focussing on the real families and experiences of gay people, he removes much of the apprehension and fear of straight people, especially religious straight people. I loved the way he introduced each family by having the parents explain how they themselves met and fell in love. It showed us that attraction and romance are at the root of all of our families, and that the relationships of gay people are really not much different than anyone else’s. If I have any misgivings about the film, they are relatively minor. One is the use of a short animated segment to try to explain some of the recent scientific research around homosexuality. I thought the tone was a little too self-consciously light-hearted and I thought the segment was largely unnecessary. The other quibble was that earlier in the film, Focus on the Family’s Dr. James Dobson is (rightfully) called out for comparing advocates of gay marriage to Hitler, but then later, actual footage of Hitler is used to describe the persecution of gay people. I don’t think you can have it both ways. Nevertheless, this is a fair, generous, and incredibly moving portrait of real people trying to reconcile their deepest-held beliefs with their very identities of themselves or of those closest to them. I’m not ashamed to tell you that I was moved to tears several times. Despite that, I think it’s a film that would move others who are perhaps not quite so close to the issues. My wife and I have a running joke. We’ve got the great idea that if only fundamentalist Christians and gay people could actually meet each other instead of hurling insults across the divide, much understanding and even reconcilation could be achieved. I’ve offered to hold a series of dinner events called “Fags and Fundies” to which we could invite quite a few of our friends. I think I’ve found the perfect film to get the discussion started. NOTE: The film is showing in various venues in the US in the coming months, but so far, there are no Toronto screening dates. Check the film’s site for any changes, and look for a DVD release in the coming months. UPDATE (January 9, 2008): The film’s Toronto premiere will be tonight at the Bloor Cinema as part of the Doc Soup programme. Director Daniel Karslake will be in attendance. Screenings at 6:30pm and 9:15pm. This entry was posted in Doc Soup, Documentaries, Film Festivals, Theatrical Release and tagged christianity, Documentaries, homosexuality, religion, Theatrical Release. Bookmark the permalink. Just wanted to draw your attention to the fact that the film is screening tonight as part of the excellent Doc Soup programme. Screenings are held at 6:30pm and 9:15pm at the Bloor Cinema and there may be some tickets available at the door. Director Daniel Karslake will be in attendance for a Q&A, too.